The Kiwi watched his side lose out to Wasps in midweek as Connacht’s ‘babies’ came undone in the final quarter. 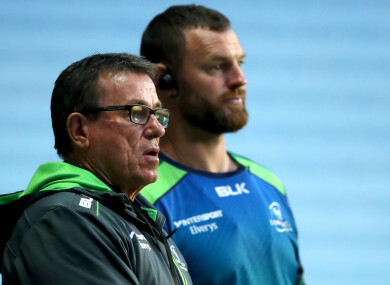 NEW CONNACHT COACH Kieran Keane says his predecessor Pat Lam has been very helpful to him over the past few months in handing over the reins at the Sportsground. Keane has had several chats with the Pro12-winning coach since he was appointed in February and says that has helped him settle in quickly. Keane’s term in charge kicked off at the Ricoh Arena in Coventry on Wednesday night when an experimental second-half line-up was caught by a late Wasps surge in a 40-22 defeat. Keane, who only arrived in Ireland a couple of weeks ago after his involvement with the Cheifs ended, said that Lam had been helpful to him over the months as he prepared to take charge. “We have had a few chats, it has been good. He has been very helpful,” said Keane, whose new charges will wrap up their preseason campaign when Lam brings his Bristol squad to the Sportsground tomorrow. “We will hopefully learn a lot from that match as well,” said Keane, whose side led by 22-12 after 65 minutes against Wasps, but with 29 players being used Connacht’s youthful 15 were caught in the final quarter. “It was a really good workout against Wasps, we gave all the guys a run and we learned a lot from it. I was pleased with the first-half, the first team performed very well. “We had the young babies on in the second-half, a couple of people got found out on a few issues but they will learn from that, they will grow from that and that was the idea of playing everybody. “I enjoyed the atmosphere, a pre-season game, seven and a half thousand people at it in a magnificent facility, it was a really worthwhile exercise for us. “It’s been a bit of a muddled week with the two fixtures but I think we learned a lot from the game against Wasps and moving forward to Bristol, we will learn a bit more there,” added Keane, whose side will open their Pro14 campaign at home to Glasgow Warriors when he will be pitted against his former Chiefs boss Dave Rennie. Email “Keane thankful for 'helpful' Lam input as he prepares to face predecessor in the Sportsground”. Feedback on “Keane thankful for 'helpful' Lam input as he prepares to face predecessor in the Sportsground”.